It seems unbelievable after this long, harsh winter, but spring is finally here. 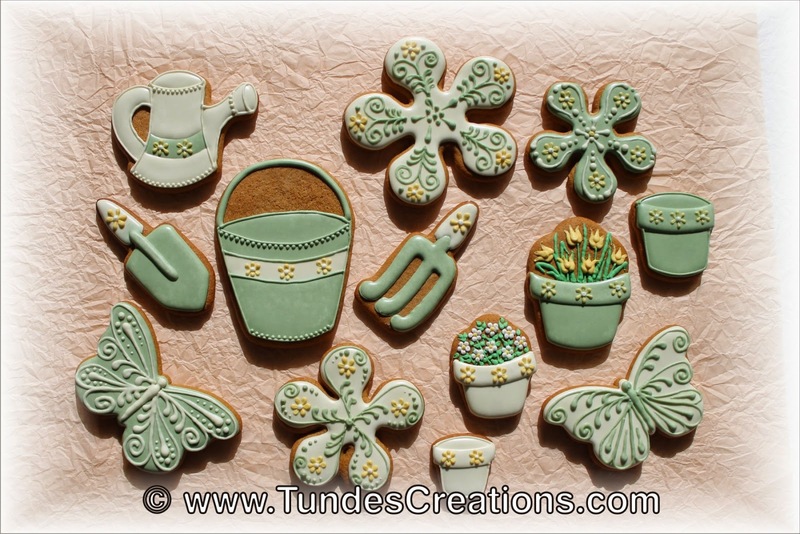 And spring means gardening, so I designed my first garden cookie set. I love colors and I have a beautiful set of Sugarflair colors, that I do hardly ever use, as it's usually easier to just reach for the colors I am used to. But this time I decided to work with my Sugarflair colors and I truly love them. The base color of this set is Spruce Green, the complementing color has a hint of Khaki coloring in it. The flowers are colored with Egyptian orange and the middle of the flowers is white. 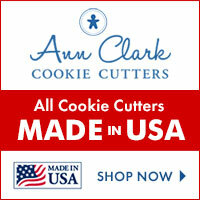 You can find all these cookie cutters at Cookie Cutter Kingdom. The garden tools and the flower pots are my design, the flowers and these gorgeous butterflies are CCK designs. I hope you will enjoy these videos and maybe creating your own garden set one day! Hi Tunde, I just found your site and your YouTube channel. I love your style of decorating. On your YouTube channel you have a video on how to make a 3-D cradle cookie. I looked on your site for any references pertaining to the video. I would like to buy the cutters for the cradle. I've looked online but can't find any. Do you have any links where I can buy those cutters? Thank you so much. And please keep making videos they are beautiful! I designed that cradle cutter for Cookie Cutter Kingdom and it will be available in their shop shortly. I will post here as soon as it's available and my post will include the link to their shop. It will be posted in this shop section: https://www.etsy.com/shop/CookieCutterKingdom?section_id=16944730&ref=shopsection_leftnav_10. Great! I will look for the cutters soon. Thank you for blessing us with your amazing talents. I love watching your videos!